Peel and cut potatoes into bite size pieces and keep aside. Heat 1 tbsp oil in a pan and add whole red chilly, half of chopped onion, ginger garlic paste, grated coconut, coriander powder, few curry leaves and stir fry until the mixture is light golden brown. When cool enough grind this mixture to a smooth paste. Heat remaining oil in the pan and add tomato pieces and sauté 6-8 mints. To this add green peas, cubed potato pieces, and rest of the chopped onion and sauté for 5 minutes. Now add ground masala, turmeric powder, salt and sauté. Add 2 ½ cups of boiling water cover the pan and cook for 15-20 minutes on medium flame or until the vegetables are cooked and the gravy thickens. Garnish with coriander leaves and serve hot with chapatti or any other Indian flat bread, rice or even with bread. Notes: Instead of fresh/ frozen peas you can use dried green peas too. 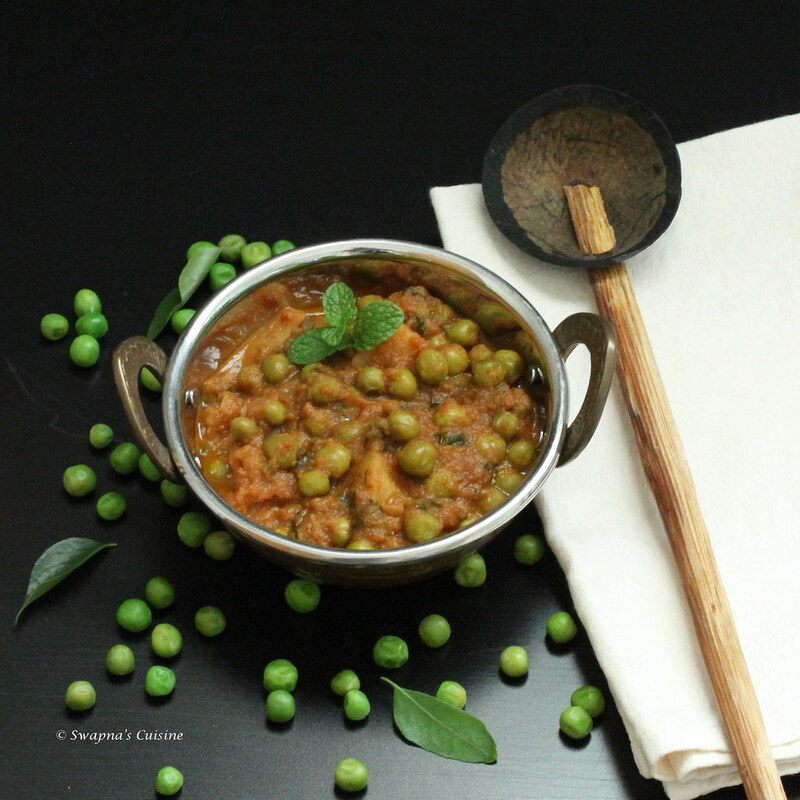 If using dried green peas soak it over night and pressure cook the curry. I love peas, but don't make it as often because my family is not fond of peas. 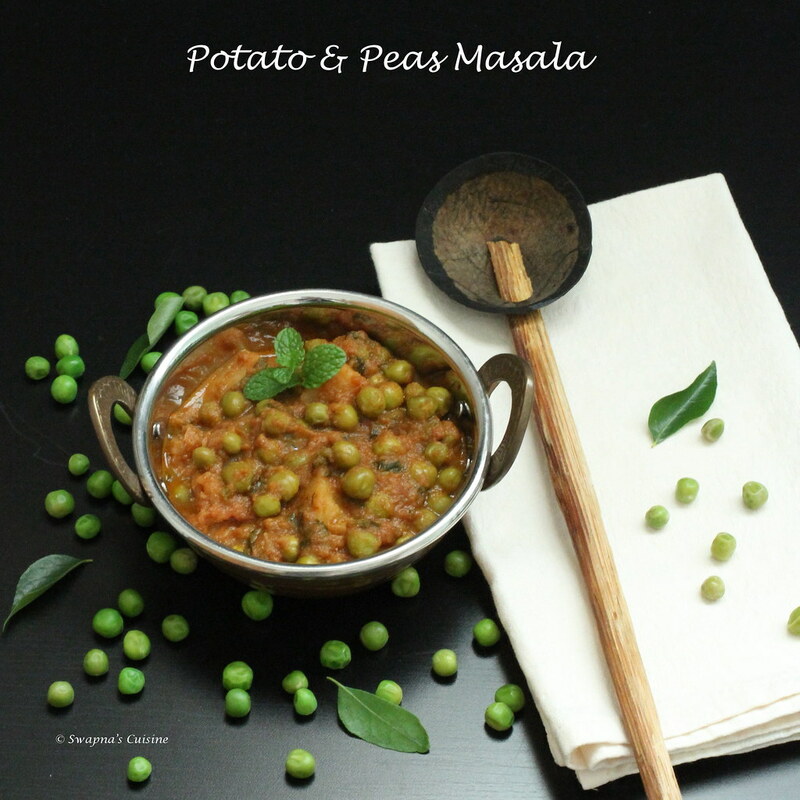 The peas masala with aloo is very delicious. Looks so delicious. Sadly, the fresh peas season is over here. Loved this curry.. Loved the clicks.. too good. Here Han sis oposite he don't like when i add peas into rice dishes ( he would eat them thought) but if i mak a curry with peas he loves it, this looks so good. Yummy side dish for rotis,inviting. Amazing recipe......best homemade paneer butter masala I've had. Hi Sapna. Thanks for sharing! First thing firdt.. the presentation is amazing! And recipe reads very good. I really love the idea of grinding the masala after sauteing. Usually we dont do that with indian cuisine. However, the final look disappoints me a bit. I would prefer it to be looking a little more richer. I think we can do that by reducing water & increasing the oil. I am cooking this tonight! Thanks again.